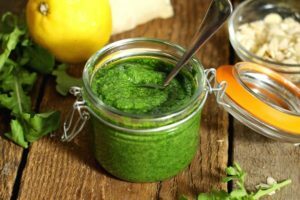 This peppery arugula pesto with toasted almonds makes a fantastic condiment for use in seafood recipes, as sauce in pasta, or as a spread for crackers, sandwiches, and other appetizers. Arugula (also known as rocket in the UK), is a delicious, peppery little green most often grown as a micro-green and used in salads. 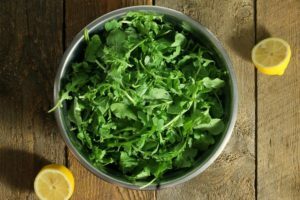 While the peppery-ness can be quite strong at first, (especially if you’ve never had arugula before), it makes a great contrast to sweet flavors and can add some kick to bland or mild dishes. 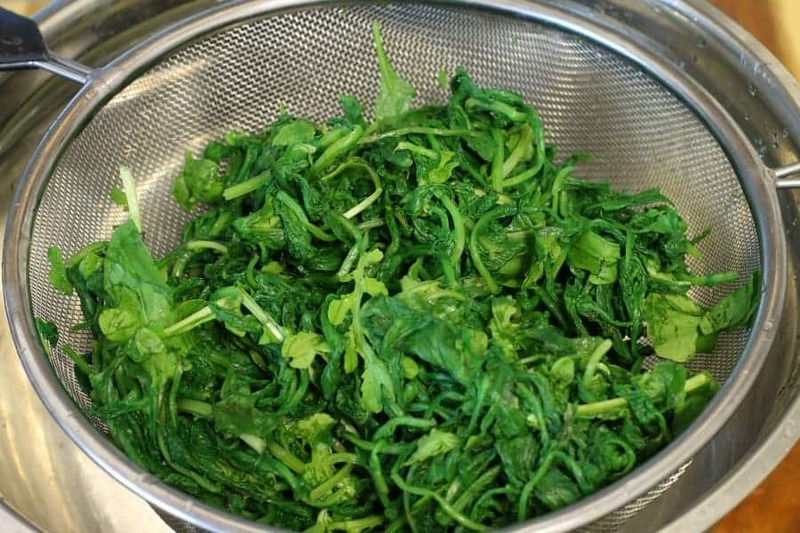 Personally, I love eating arugula fresh and usually add it into my mixed greens from the garden to add a little zest and flavor to my salads. A simple roasted garlic vinaigrette is all that’s needed to add some sweetness, to balance the sharpness of the arugula. A very hardy and easy to grow green, arugula makes an excellent addition to any backyard salad garden, and grows really well in a cold frame or raised garden bed. If you have to much arugula on hand though, what do you do with it all? I usually run into this problem once a year as the arugula grows faster then I can pick it before it fully matures. This results in me harvesting pretty much all of it and turning what I don’t use in salads into arugula pesto! Since the arugula pesto freezes very well, I keep some in the fridge and freeze the rest for use throughout the winter. The pesto is great as a quick ‘sauce” in simple pasta dishes, served with salmon, or as a base for finger foods and other appetizers. For best results when freezing any kind of pesto, I would recommend vacuum sealing the pesto into bags with a vacuum sealer (affiliate link) and freezing it in flat slabs. This makes thawing small bags easy, and the pesto lasts for over 6 months! 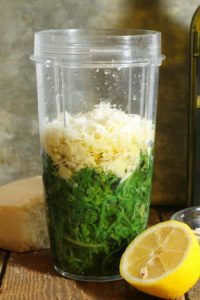 Luckily, arugula pesto is extremely easy to make, even more so if you have a food processor or Vitamix blender. Simply combine all the ingredients and BAM! You got yourself some fresh homemade pesto. 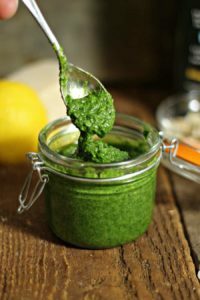 If you want to make a super bright green pesto, and do it like chefs do in a restaurant, keep reading, Otherwise skip ahead to the rest of the recipe instructions. The secret to a bright green pesto, is to blanch some of the greens. 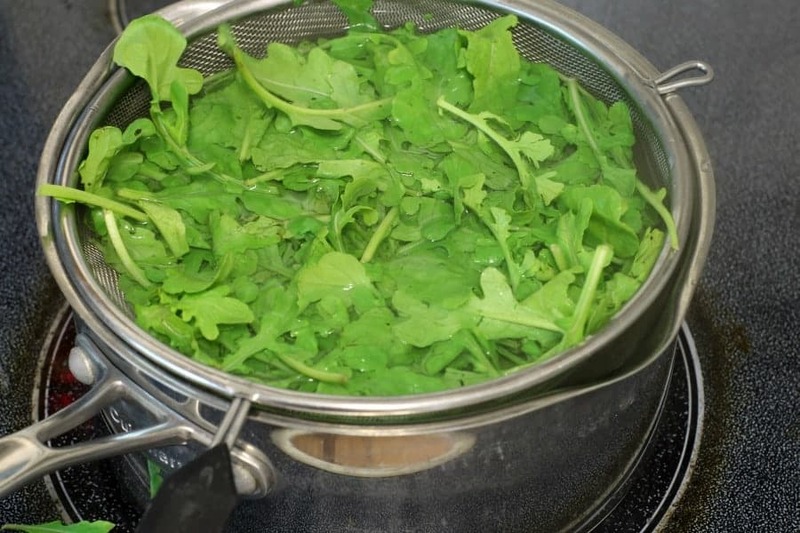 Blanching is the process of very quickly shocking the greens, or vegetables in boiling water for a second or two, and then immediately plunging it into ice water to stop it from over cooking. Dropping the arugula in boiling water for a second. The arugula is then immedietly plunged into ice water. Once cooled all the water is squeezed out of the blanched arugula. This action stops the greens from losing their color by stopping the natural enzymes from breaking down. It also has the side effect of brightening the greens, hence the bright green pesto color! If you where making basil pesto and wanted this same result, I wouldn’t blanch the basil itself, but would blanch a small amount of spinach, and add that to the pesto for color. This is the easy part. If you decided to blanch the arugula first as described above, good for you! Otherwise, it’s no big deal, your pesto will just turn out a darker green color. Start by toasting the almonds, either whole or slivered, in a dry pan in the oven on 350F. Keep an eye on them, as you don’t want them to burn! it should only take about 5 minutes or so, especially if using slivered almonds. Once the almonds are a light golden brown, and have a nutty smell, remove them from the oven and cool them completely. While the nuts are toasting, you can blanch the arugula, or measure out the rest of the ingredients. Place all the ingredients except the oil, in a food processor, mixer, or blender, and pulse until well combined. Add one third of the oil to the mix, and blitz it again. It should start to emulsify and become smooth. Slowly add the rest of the oil until a thick creamy texture is reached. If you don’t need to use quite all of the oil that’s fine. It should be pretty close though! To store the pesto simply portion it into little mason jars or other glass containers. Old pasta sauce or jam jars work great for this. If you plan on freezing the pesto, store it flat in ziploc bags or vacuum seal it into small bags. 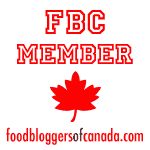 You could also choose to process the pesto in mason jars (canning them) to allow for long term storage in a cool cellar. With a nutty and peppery kick, this simple arugula pesto is a great way to season seafood dishes, pastas, or used as a condiment for meat platters. 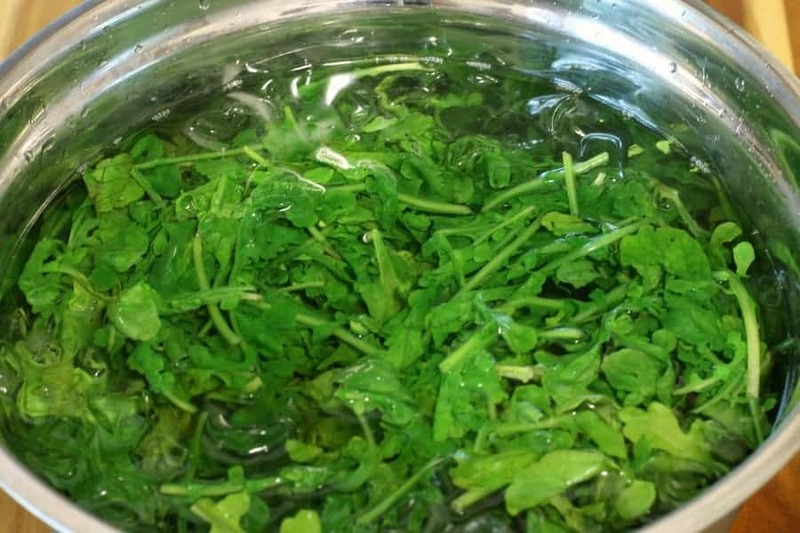 Very quickly shock the greens, in boiling water for a second or two, and then immediately plunging it into ice water to stop the arugula from over cooking. This results in a bright green pesto. Start by toasting the almonds, either whole or slivered, in a dry pan in the oven on 350F. It should only take about 5 minutes or so. Once the almonds are a light golden brown, and have a nutty smell, remove them from the oven and cool them completely. While the nuts are toasting, you can blanch the arugula as described above. This step is optional. Place all the ingredients except the oil, in a food processor, mixer, or blender, and pulse until well combined. Add one third of the oil to the mix, and blitz it again. Slowly add the rest of the oil until a thick creamy texture is reached. To store the pesto simply portion it into little mason jars or other glass containers. If you plan on freezing the pesto, store it flat in ziploc bags or vacuum seal it into small bags. If you decide not to blanch the arugula and simple blitz everything together it's no big deal, your pesto will just turn out a darker green color. When storing the pesto in mason jars you could choose to process the pesto in mason jars (canning them) to allow for long term storage in a cool cellar. I love arugula, but have never made pesto with it. It must sure be bursting with flavours. I bookmarked your recipe to try it out. Thanks for sharing. I love arugula! I even grow it on my balcony in a pot and it does quite well. I will have to try this recipe. Thanks for sharing! The combination of arugula with almonds sounds amazing! I have to try this one soon! This pesto sounds amazingly delicious! And so easy to make! It is easy to make! I love having pesto on-hand to add to my pasta, mayo for sandwiches etc! This is my kind of pesto, almonds are a great way to add healthy protein. I am making this soon. I’d love to see a picture when you make it! I love adding almonds to my pesto, though any nuts can be used really. Hey Markus, thank you for the great tip about blanching the greens to keep the bright green color. 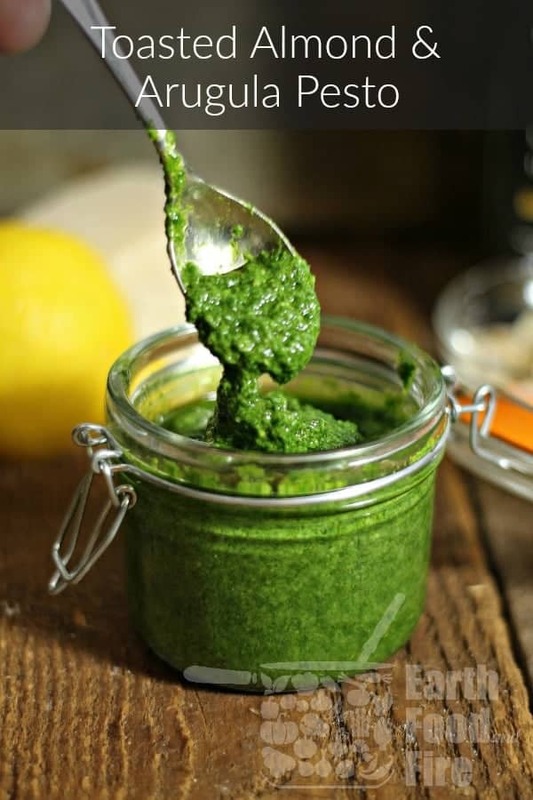 My clean eating arugula pesto is quite similar to yours regarding ingredients, but with your blanching tip I’ll finally achieve also an attractive green color. Your welcome! It’s a simple little trick but it really helps lock in the color! Wow, what a gorgeous combination to create a pesto! I love arugula love this is right up my street. Thanks for sharing! 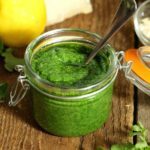 I love a good homemade pesto recipe and this one sounds delicious!